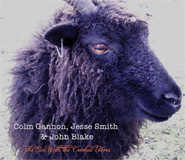 To view the individual biographies for: Jesse Smith, Colm Gannon and John Blake, simply click on the links to the left of this page. The combination of accordion and fiddle is one of the most enduring pairings when it comes to duet playing in Irish traditional music. If music is about expression then the duet still allows space for the players to retain a great deal of their individual musical voices - which inevitably decreases with each additional instrument joining the ensemble. There are also different levels at which a duet can operate – depending on the skill, taste, approach and relationship of the musicians. Sometimes the performance of the musicians can be constrained and the capability of each instrument diluted in an effort to make the two instruments sound like one. This is not the approach adopted by Colm and Jesse. They are joined by John Blake on piano and guitar and he also contributes on flute on several tracks. Although all are recognised as accomplished solo performers, this in itself is not a guarantee that the musical outcome of their partnership will be successful or satisfying. The reason it is, however, is because they “speak” to each other through their chosen instruments with the same musical accent. The resulting conversation is certainly worth eavesdropping on. Colm and Jesse share a common background in having their roots in the music tradition of Irish America and John in Irish London. However, the myriad of sources quoted by them for the music they have presented on this recording indicates a common and ongoing journey of searching, listening and learning from many aspects of the tradition. From the earliest printed collections and audio recordings to contemporary players and composers, they show a hearty appetite and most importantly, discerning ears for adding to their store of music. They have breathed life into notes that have long remained silent on the pages of 19th century manuscripts as well as playing tunes of a comparatively recent vintage. Although we are left in no doubt as to their instrumental ability, it is obvious that it is the tunes they wish us to admire. As listeners it is a treat to hear the fruits of their endeavours. As musicians it is also worthwhile to be reminded or made aware of the variety of sources of our music and how worthwhile it is to look to the past to rediscover great music that would enhance the repertoire of any traditional musician.